I have just got back from quite an amazing New York experience. 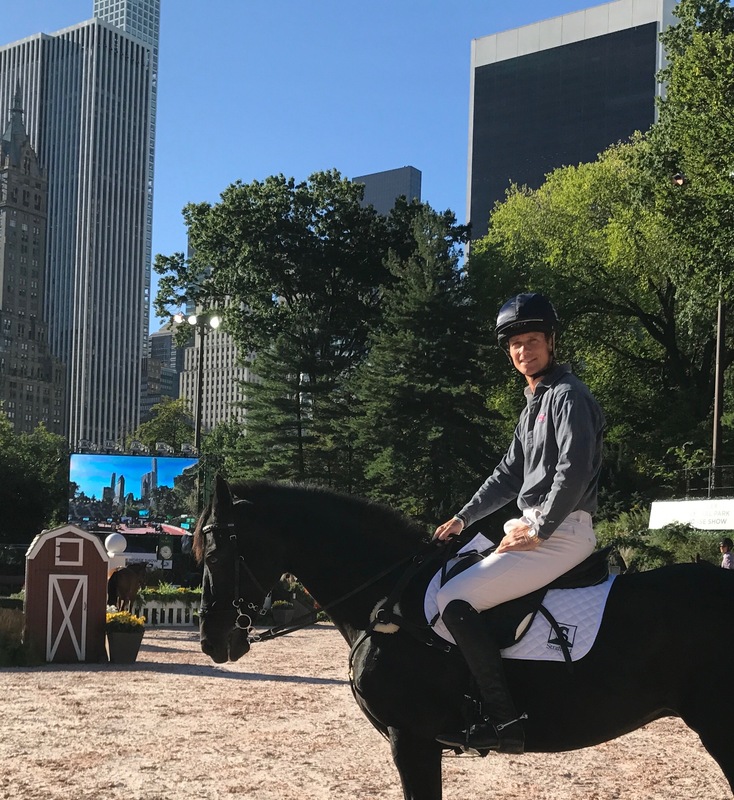 It was my first trip to New York and combining it with horses was not something that I ever anticipated. I travelled out on Thursday night so was able to try the horse I was to ride on Friday. I had been very kindly lent the horse by Anna Loschiavo and owners Rodney and Gina Giudici-Oakes. Prince Renan is a lovely 2* horse and had a super jump so I was very lucky with my draw. I met up with SAP on the Friday and it was great to hear their enthusiasm with ERM going forward. The New York venue was impressive and in a beautiful setting on the corner of Central Park. For the last few years they have had a Show Jumping show there and a Dressage evening, and this year the Eventing bonanza was able to fit in. There were 24 entries, and Oliver Townend, Bill Levett and I had been invited to come over from the UK - for the foreign flavour. 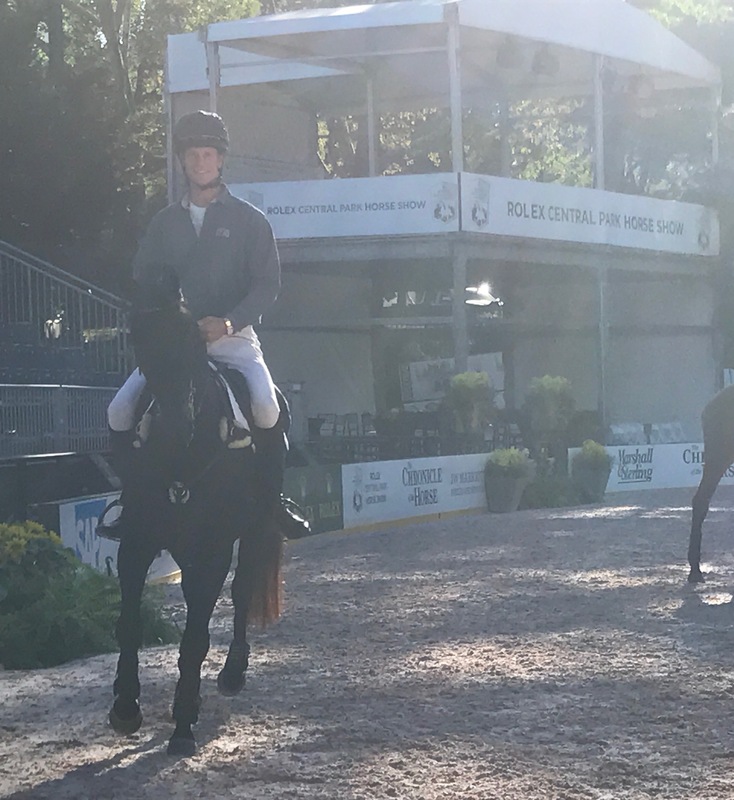 We were luckily able to familiarise the horses with the arena as it was so intense, and Mark Phillips had designed a very clever course. The course was made up of 26 fences, mainly of solid portables, but the first and last were show jumps. Mark Phillips really did well with his distances and turns, and gave us an excellent test. The course was labelled as a 1* course but in that space, and designed in the way it was, it was certainly nearer a 2*plus in technicality. We were all able to walk the course at 7pm on the Saturday and we all felt that remembering the way was going to be the main challenge. Several jumps had to be jumped twice and several more jumped in both directions. Oli and I were drawn last so we were able to watch a few go first, and some partnerships really showed us how it should be done. When it came down to our turn I have to say that the butterflies were fairly active, and the pressure was on as it was the fastest time that counted. So the pressure could well have caused a few errors to creep in particularly on a strange horse. Prince very much came up trumps and coped well with the atmosphere and jumped an excellent clear. As he is prone to do once or twice he chipped in a short stride but that didn’t worry him and he didn’t stop. Because our time was one of the 6th fastest we had to jump again in the ‘jump off' and as we were last to go the pressure was particularly on. Prince went even better this time with no short strides and quite a good time, and Oli was impressively quick and was so unlucky to knock the last fence down. We lost second place by 2 seconds and we incurred a 4 second penalty with the fence down. It was an exciting closely fought competition and Oli and I were very excited to finish third. Congratulations to Ryan Wood and his pair, Ryan was riding one of Sarah Hughes’ horse, Sarah owns Barrichello. It was a fantastic evening for Eventing and the competition showcased the sport brilliantly. Mark Bellissimo had masterminded the competition and certainly did a superb job. I had an excellent three days in New York and I got some terrific exposure for Jeep, and I hope they make the most of the coverage. I am now back in the UK and off to Osberton. We have got a very busy week, with lots of horses competing at different levels. The Osberton schedule is quite mental with so much going on and and I am certainly hoping that it all comes together. I enjoy Osberton but the way the calendar has worked out there was nowhere else to take the horses so they have all had to come here. With not going to Blair there was no other 1* and 2* and the young horse Championships are an autumn priority. We really do need some more choice!